Back to this one, a rather half hearted attempt at some work on it today. Busy with commissions currently so my original work is taking a bit of a back seat, hope to carry on with this as and when I find the time. It desperately needs a background, that will be my next job I think! 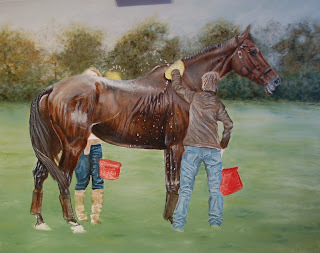 At least I think it is finished, have signed it but will have a look with fresh eyes tomorrow! The finish is finally in sight, not much more left to do now! I think I might be able to get it done by tomorrow if I'm lucky! Lots of time spent on it over the weekend, just the finest detail to go really. After that I'll be praying for overcast but dry weather to photograph the final work in... the colours are much richer than they show here, light coming in through the windows seems to wash out the colours terribly! 6 days left to work on this. More done today, finally made more of a start on the people which I have been procrastinating over so far! Only 7 days left until I need to photograph this, finished, to send off with an exhibition entry! Click to make the picture bigger and you will see I have LOTS left to do!!!!! I'm feeling a little relieved that this is looking a little less like a childrens painting, and starting to come together a bit more. Phew! Still very rough, but has a bit more structure now at least. I think this one will be my main focus now for the next week or so as I have an exhibition deadline that I would really like to have it ready for. Fingers crossed I can finish it in time! A bit more done on this one. Still not sure what to do with the background! 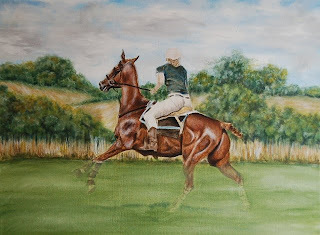 I think it is going to have to be blurry grass and trees but I seem to be putting off actually painting it! Another new painting based on my Badminton photos! This one is based on the many many MANY (100s!) 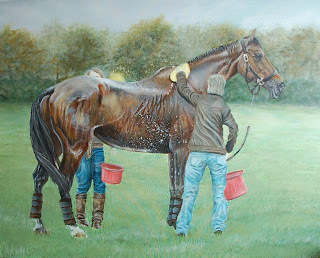 of photos I took of horses being washed down and cooled off after their XC rounds. 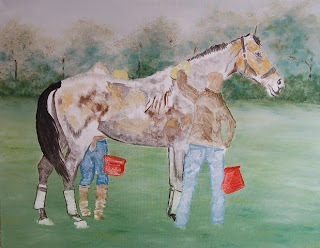 It was fascinating watching teams of grooms, vets, riders and owners tend to their beautiful but exhausted horses. I hope to include lots of bits from all my best photos of water splashing over horses' backs but the main photos I am working from are of the gelding Muschamp Impala, who stood so beautifully being washed down that I think I ended up with about 70 or so photos of him! 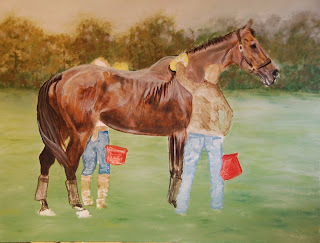 The photo of my progress so far on this painting is a good example of why I can find the first few layers of my paintings a little disheartening! So far this looks like my one year old could have painted it... 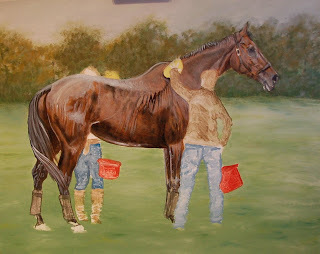 I have the base of the background in, have blocked in some colour on the grooms and have roughly sketched some of the main shadows on the horse. I'm working to a tight exhibition entry deadline so I'm hoping it starts to come together after a few more layers! Fingers crossed! 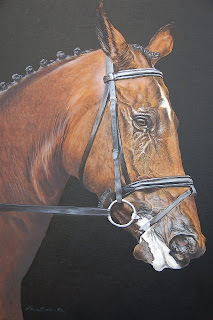 This new painting is based on a series of photos I took of Polly Stockton and Regulus competing in the cross country phase of Badminton Horse Trials last weekend. Oil on canvas, 50cm x 35cm. 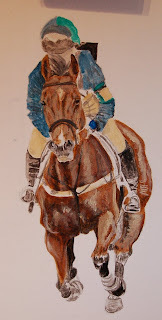 I have only just started it, sketched out the basic colours very thinly and roughly this morning. 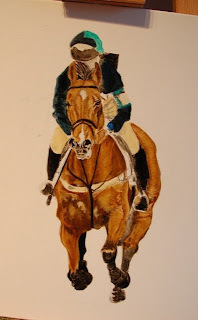 I am unsure of whether I will stay true to my photos and keep it a painting of the specific horse and rider, or whether I'll use some artistic licence and make it a bit different, will see how the mood takes me! Have no idea what I am going to have as the background yet... decisions decisions! I haven't done much on this at all since my last post about it! 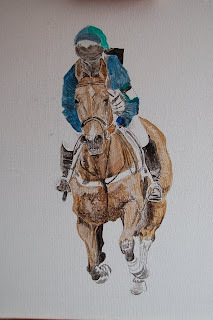 For some reason it just doesn't seem to be going as well as I would like, so I'm a bit fed up with it... a shame because I love the pose of the horse and rider and was really excited about painting it! Commissions and babies and life in general have kept me from my original work these last few months so I am now mid last minute rush to get paintings completed in time for exhibition deadlines! I managed to finish my latest piece 'Rocket Science' this week. The subject is a striking eventer photographed by Helen Heffron whilst competing in the dressage phase of an event last year. I am very grateful to Helen for allowing me to work from her beautiful photos of him. 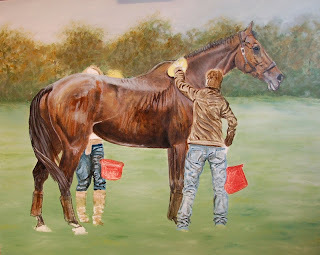 I have just started a further two paintings, both based on some of the many many photographs I took last weekend at Badminton Horse Trials. Fellow equestrian artist Sally Lancaster and I had a wonderful day watching the cross country and working hard to shoot as many potential decent reference photos as possible!! !